‘deliciously and maddeningly unclassifiable’ – Chris Sharp, The Wire. ‘Sylt is a wonderful deep album that proves that experimental music can be accessible to a bigger audience. One of the most surprising new albums in 2007. Perfect!’ – Michael Muck, Cuemix Magazine. 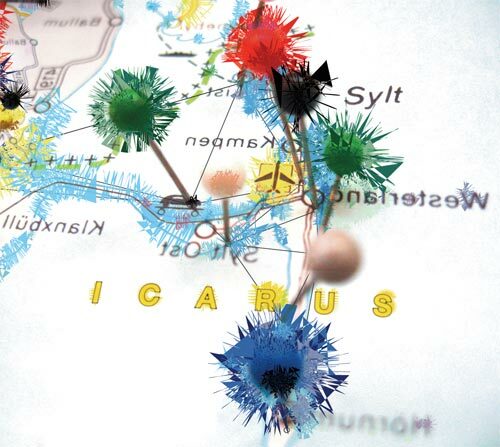 ‘Icarus are one of the most underrated and overlooked electronic groups who are so perfect at their craft, it almost concerns me how they´ve gone virtually unnoticed. They deserve far more attention then they have ever gotten throughout their entire career, and it is my hope this album will prompt people to invest time into the strange, wonderful and confusing musical progression that is Ollie Bown and Sam Britton´s music project, Icarus.’ – Eric Common, The Silent Ballet. ‘Giver man sig tid til at opleve Icarus’ til tider frenetiske og altid krævende musik, belønnes man med et givende album, som bør begejstre fans af Sun Ra såvel som Autechre.’ – Jesper Buhl, Gaffa. "Sylt" is Icarus’ first album in two years, following the understated Carnivalesque in 2005, and the acclaimed I Tweet the Birdy Electric in 2004, over which time the duo Ollie Bown and Sam Britton have continued working on related projects in electroacoustic performance, composition and music-related research. The album builds on the band’s inquisitive approach to electronic music production acquired over 6 album releases spanning over a decade, and spread across a mix of record labels: The Leaf Label, Output, Hydrogen Dukebox, Temporary Residence, Not Applicable, and for this latest release, Rump Recordings. "Sylt" was devised around two extended improvised tracks, "First Inf(e)rænce " and "Second Inf(e)rænce", taken from one live performance in Toulouse in 2006. These recordings represent the accumulation of unreleased material built up over a spate of live performances as well as the documentation of the band’s development of an improvised electronic music style in which flourishes of rhythmic and harmonic structures are restlessly set up against each other by the duo. Alongside these live recordings, "Sylt" also revisits the recognisable structures of Icarus’ earlier anthemic style in tracks such as "Keet" and "Volks", outbursts of joyous rhythmic lunacy in the bricolage of "Selfautoparent", and a developing sense of instrumental musique concrète in tracks such as "Jyske" and "Rugkiks"